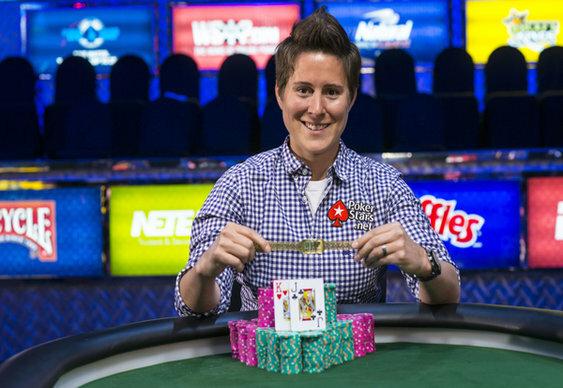 Vanessa Selbst confirmed her position as one of the world's best players after claiming a third World Series of Poker bracelet overnight. The Yale law graduate beat Jason Mo in the heads up portion of the $25k Mixed-Max event to boost her bankroll by $871,148. Selbst overturned a chip deficit that stretched to almost three to one at one stage, helped largely by scooping a massive 5 million chip pot that proved a real momentum changer. After an opening 250,000 bet from Selbst, Mo re-raised to 750,000 and Selbst made the call. Mo checked the 10hJh5s flop with Selbst continuing for 580,000. This time Mo made the call. Both players checked after the Qh appeared on the turn. A seeminlgy innocuous 2s on the river prompted a 1.315m lead from Mo which Selbst called, revealing QQ which was well ahead of Mo's AsQs. With that, Selbst took control of the match and sealed the deal shortly after when her KhJc held againt Mo's 9d7d. "I understand why people want to talk about women and the achievements of women in history that way," Selbst told WSOP.com. "Obviously, I would like to be considered in a conversation for the best poker player, not just the best female poker player. I think I’m starting to get there and people are starting to recognize that."